Lam Van Bang, the founder of the museum, was imprisoned on Phu Quoc during the war. He wanted to make his house a museum in tribute to his "roommates" during that time. Many of them have become guides among the 40 volunteers working there. The hell that the prisoners of Phu Quôc lived through during the war is represented in an area of 2,000 square meters containing 4,000 archived items. The photos and other items were donated by agencies, organizations, and individuals inside and outside Vietnam. 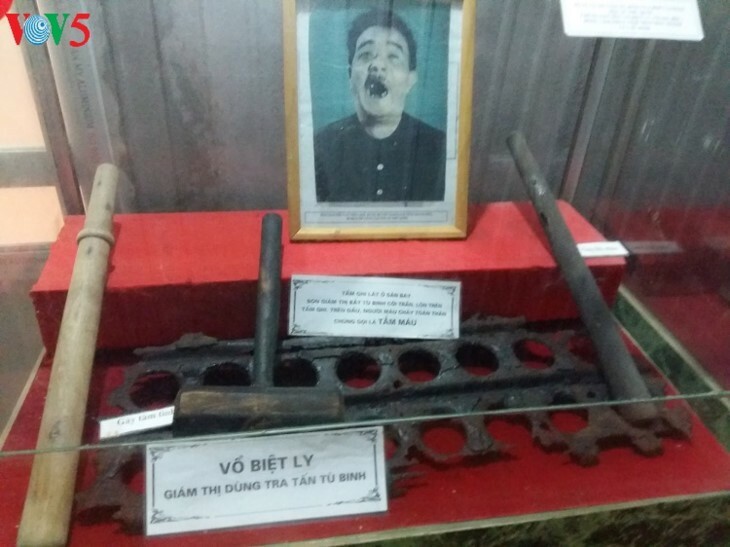 Each item tells a story about a difficult but glorious time in Vietnamese history. Kiêu Van Uych, deputy director of the museum, said: "The items on display are covered with the blood of our fellow soldiers. There are teeth pulled by the jailers and bullets that took the lives of our friends. The museum has 8 exhibition halls and a Party organization affiliated with the Phu Xuyên District Party Committee. Most of the Party members are former Phu Quoc prisoners. " Exhibited items recreate the barbarities suffered by the detainees and evoke strong emotions in visitors. Dong Thi Hop, a museum volunteer, said: "Our most sacred item is a Party flag colored with real blood. It was used during initiation ceremonies for new Party members as a tribute to the soldiers who died in Phu Quoc Prison. A prisoner named Nguyen Thê Nghia made the flag from bandages and used his own blood to color the flag. The sickle and hammer, the emblem of the Communist Party, were not drawn with ink but with a liquid made of yellow pills mixed with water. This flag is precious and unique in the world. " The museum’s director Lam Van Bang founded the museum to teach younger generations about the courage of revolutionary soldiers and their sacrifices for the nation. Mr. Bang said: "The horrible tortures inflected by their enemies could not discourage the revolutionaries. They all remained faithful to the Party and the Fatherland. Through this museum, we want to convey this message: we owe our independence to the Party, the heroes who died for the Fatherland and the war invalids. We must never forget their sacrifice." Since it opened, the museum has received leaders of the Party, the State and the city of Hanoi and tens of thousands of their visitors including veterans, relatives of martyrs, and students.